Once we started talking about authors who straddle the line between traditional publishing and ebooks, they seemed to be all over the place! Lauren Baratz-Logsted, author of twenty-three books published through traditional publishers, has now put out nine on her own. The Hat City Middle School series is the first of a new series... and it starts off with a bang. Told in alternating first person chapters - sometimes the guys, sometimes the girls, and then individual voices appear - this book explores stereotype in an atypical way. Some readers may have trouble feeling that they can get "into" the book, as initially, individual characters don't really stand out. Eventually, Robbie Knightly does - and he becomes the title character of the sequel - but for readers who prefer character driven and stories driven by incidents or themes, it may be hard to find access to the story. I can see this book being read aloud in a classroom setting, and being used in a social science environment to talk about the differences, similarities, strengths and weaknesses of boys and girls. Reader Gut Reaction: My first reaction was that I couldn't STAND Mrs. C -- C might stand for Crazy, according to the girls. Or, it might stand for Cool, according to the boys. Mrs. C. was the fifth grade math substitute for Hat City Middle School, when Ms. Robinson was gone. Ms. Robinson had left the usual math drills... but Mrs. C didn't want to just do the usual thing. She set the students a math problem of her own. Even though No-H (we have a Sara like that in my writing group) raised her hand with the answer - for long minutes - Mrs. C. ignored her. She called on a boy -- like she'd been doing all morning long. When the boy was right, Mrs. C. said something absolutely unforgivable. She said that boys were much better than girls at math. A group of older students might have seen this comment as a reason for a real fuss. The girls in math class do argue, but if they were older, they might have demanded facts and statistics, and really pitched a fit. For the most part, Mrs. C.'s statement is met with speechless shock. The outrage comes later -- when Ms. Robinson comes back -- AND SAYS THAT IT MRS. C MIGHT BE RIGHT. There's really nothing for it but to find out the truth for themselves, right? Who's the greatest at Hat City Middle School? The guys and the girls face off - over EVERYTHING. Who eats fastest? Who can make the most money at the car wash? Who's part of the greatest at gender? The answer might surprise readers - or, it might make them nod their heads in recognition. Recommended for Fans Of...: THE LEMONADE WAR series, by Jacqueline Davies; Phyllis Reynolds Naylor's THE BOYS START THE WAR series; DO THE MATH, by Wendy Licthman, and other middle grade tales. 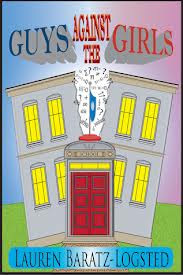 Cover Chatter: Ebooks don't always have very prepossessing covers, but this one is just right: a school, being split down the middle, spewing math symbols. Both literally and idealistically, that's Hat City Middle School's fifth grade math class, all right. FTC: The author provided me with a copy of this book; no money exchanged hands, and the opinions shared in this review are mine. You can find GUYS AGAINST THE GIRLS by Lauren Baratz-Logsted @ Amazon.com. This series sounds really, really fun. I'll try it! And I can't help being curious why the author went out on her own with it. I'm sure she'll pop by and say so, but she mentioned that EVEN THOUGH she's an author with a reasonably well-known name, after 200,000 copies sold on a series of hers, the publisher has no plans to add sequels. I think that has something to do with her eagerness to try things on her own. Thanks for the review! As to the question of why I went out on my own with this: I've had 32 books published since 2003, 23 of which have been with New York publishers. I've written for adults, teens and children, in almost every genre available. I think it's safe to say, then, that I like trying new things. So when the question is: Why do it this way? ; the answer becomes: Why not do it this way? Got a Book? Give a Book! Or Three. Toon Thursday: Celebrity Death Match Returns!